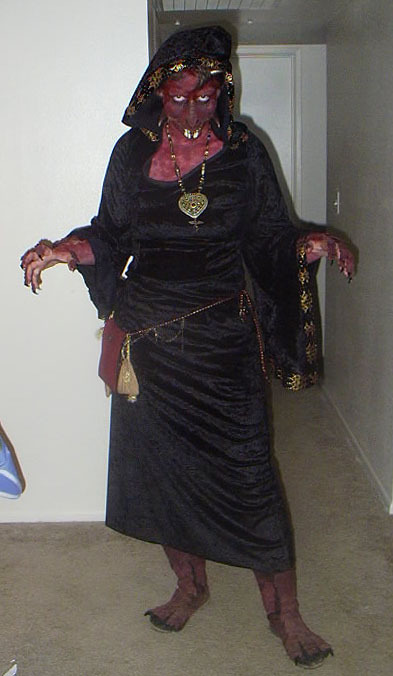 This costume was an almost spur-of-the-moment project, that turned into my first real experience wearing a prosthetic of my own creation. The name "T'char" is kind of a role-playing in joke. The hooded dress she's wearing is a storebought one that I fell in love with when I discovered that I didn't look half bad in it... but I hadn't really gotten a chance to wear it. My friends were discussing our usual trip to the vastly overpriced, but always amusing, Renaissance Festival, and I just decided it'd be fun to try doing a prosthetic. Just to see if I could, basically. I bought some Sculpey (a type of modeling clay that doesn't dry unless baked) and built the muzzle, bottom jaw, and eyebrow ridges for the dragon prosthetic over a plaster cast of my own face. 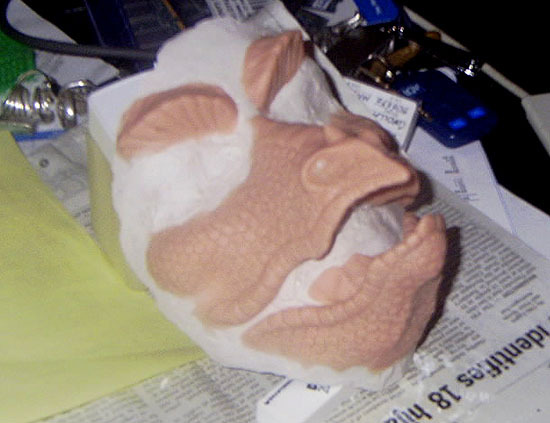 After some trial and error (and at least one more full re-sculpturing later), I had a mold of my dragon face, which I cast with rubber latex, tinted dark red. (I've only now started messing with foam latex, and it's a lot more difficult to work with!) I built the teeth out of Sculpey, baked them and attached them into the top and bottom jaw. For the horns, I took a pair of the Woochie brand latex horns that I already had, and made a mold of them. 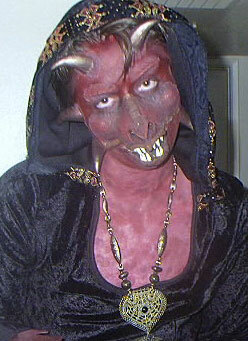 I cast it several times using red-tinted latex, and painted the horns with light gold nail polish. The feet, too, were put together pretty quickly. I started with a pair of slippers, attached some fabric to form "boots" of sorts, with lumps for the three toes in front, and one toe up the side. I then attached the claws and more rubber latex scales. People generally seemed impressed with the final effect. 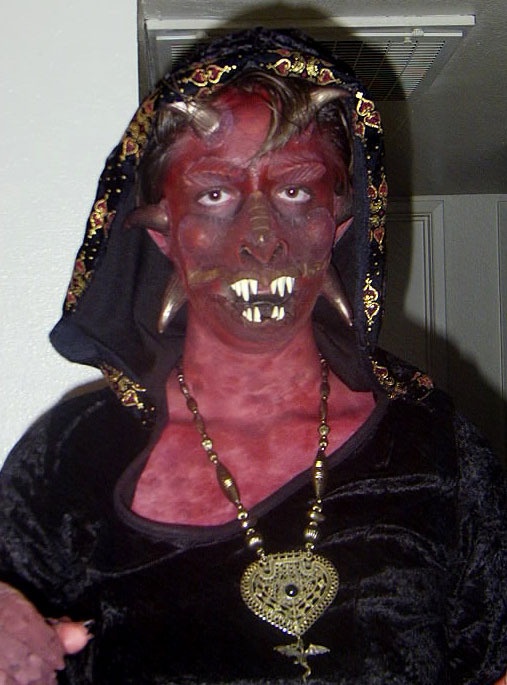 The makeup I used was just regular greasepaint. 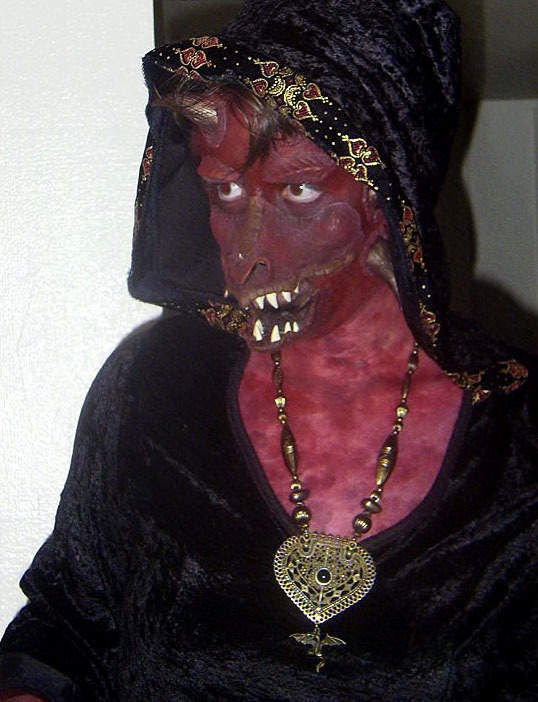 I had the so-called "injury stack" made by Cinema Secrets, which had yellow, dark red, purple, and black makeup — the perfect colors for a dragon, I thought. On the portions of my skin covered only by makeup, I just used a finger to dab the makeup on, giving it a mottled, scaly appearance. 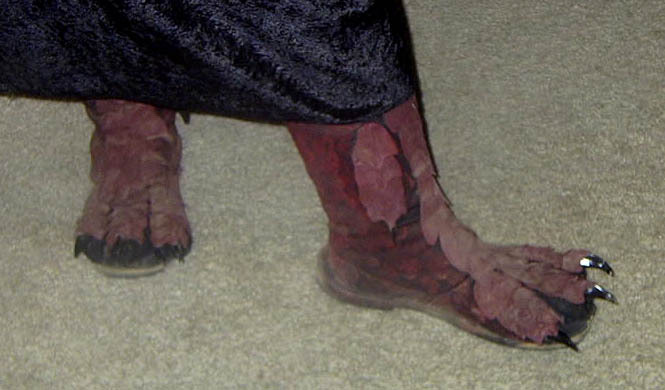 A mix of the red and purple makeup ended up matching the color of my prosthetics almost perfectly. I set the makeup with several coats of baby powder. Must've worked pretty well... The pictures on this page were taken after a full day in the sun at the Renaissance Festival, and the makeup still looks darned good. But it was a lot of fun. I'm very pleased with how my first prosthetic turned out! I wasn't expecting it to be a success, especially not as much of one as this one turned out to be.